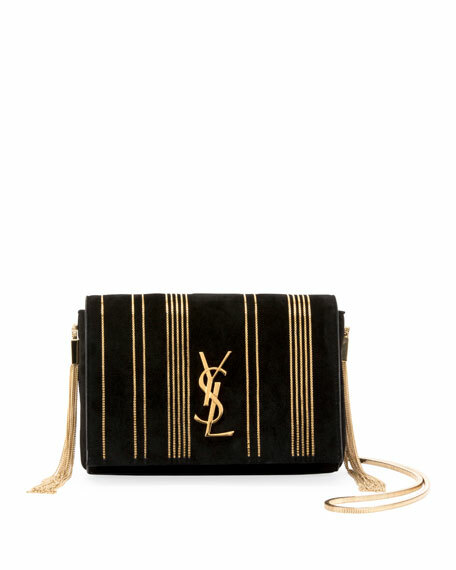 Saint Laurent "Kate" crossbody bag in soft goat suede with thin metal chain stripes and tassels. Snake-chain shoulder strap, 21.7" drop. 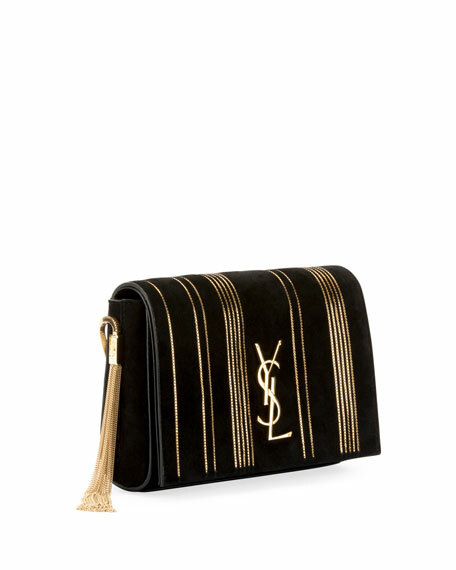 Signature YSL at center front. 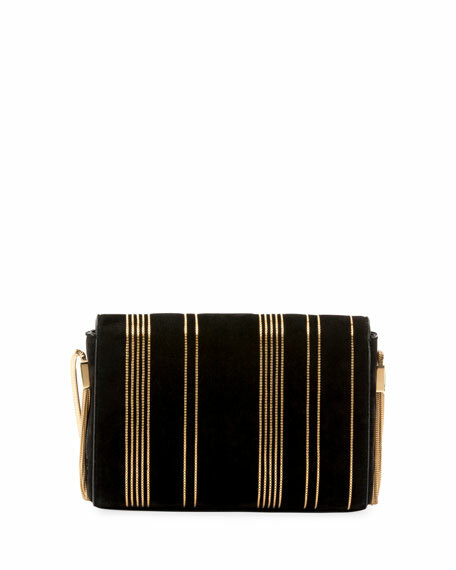 5.1"H x 7.1"W x 1.8"D.
Alexander Wang belt bag in stretch fabric with logo at center front. Adjustable strap with chain detail; may be carried around waist or over the shoulder. Zip top closure. Five exterior zip pockets. 4.3"H x 8.7"W x 3.5"D. Nylon lining. Imported. Kooreloo shoulder bag in woven cotton. Detachable chain crossbody strap, 24.4" drop. Flap top with fringe trim; magnetic closure. Interior, slip pocket; cotton lining. 6.3"H x 10.2"W x 3.5"D. "New Yorker Soho" is made in Greece. Nancy Gonzalez bag in signature metallic Caiman crocodile. Convertible, croc-covered curb chain strap can be worn three ways. Flap top with magnetic closure. Exterior, back slip pocket. Divided, suede-lined interior. Three card slots. 6.5"H x 8.7"W x 4.5"D. Handmade in Colombia.